simplecall’s low cost rates will keep you worry-free about ever having to face another huge phone bill again. With simplecall, you can talk to your family, friends or even business associates in India for hours. Our PINless international calling service gives you a chance to make calls India at a cheap rates starting from just 2¢ /min for landline and mobiles. Not only do you get cheap rates with us, you also get several other features - and they all come for free! 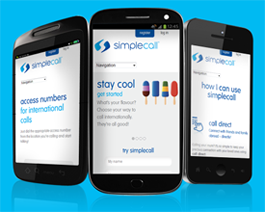 To benefit from the use of our services, register for free at www.simplecall.com and become a simplecaller! Compared to what a standard call with a traditional operator would cost you from the US to India , our international calling service can save you more 90% on your phone bills. Moreover, unlike conventional calling cards, simplecall isn’t plastic, and you won’t have to carry it around with you everywhere you go or worry about losing it. You can access your account wherever you have the internet. There are about 2 million Indians in the US, and Indians form an important community that has contributed significantly to the US economy . Indians are also the 3rd largest ethnic group in the US. India is also home to the famed Taj Mahal, one of the great wonders of the world, which brings a large tourist population to India. More than a million people visit India from the US. So the next time your friends or relatives are in India, talk to them using simplecall.